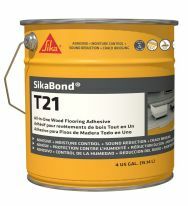 Ultrabond ECO 975 is a 100%-solids, one-component, moisture-cured urethane adhesive specifically designed for the installation of domestic solid and engineered wood flooring. 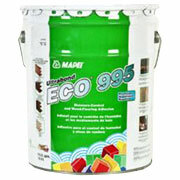 Ultrabond ECO 995 is MAPEI’s premium, 100%-solids, one-component, moisture-curing urethane adhesive for all types of wood flooring and bamboo. Ultrabond ECO 995 can be used in a single-coat application method that provides a superior bond and moisture vapor emission control on concrete slabs. 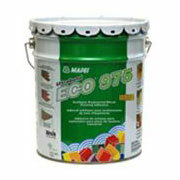 Ultrabond ECO 995 also provides sound-reduction properties, making it suitable for use in multi-unit housing projects. 25 years of providing premier floor covering products and service throughout Florida, the Caribbean, and Central and South America. Wholesale distributor specializing in more than 500 tools and accessories for the installation of carpet, wood, ceramic tile, VCT, sheet vinyl and rubber flooring. 26 branches to ensure your needs are met promptly and with the highest level of customer service. Flooring Supplies, Hardwood, Carpet, Tile, Stone, Sheet, Vinyl, LVT, Adhesives, Soundproofing, Waterproofing, Thin, Set, Mortar, Grout, Miami, Pensacola, Tallahassee, Fort Walton, Panama City, Destin.